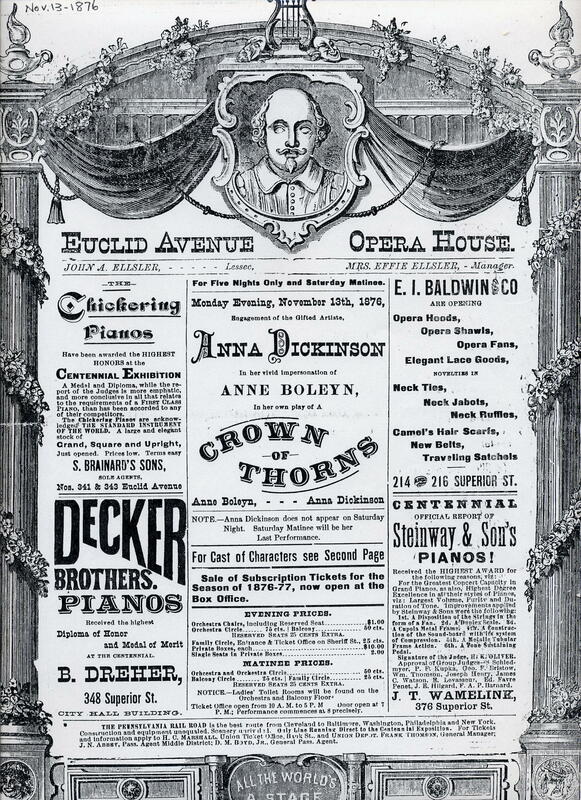 In November of 1876, twenty-one year old Joseph Haworth played the role of Cromwell opposite Anna Dickinson in her own play Crown of Thorns at the Euclid Avenue Opera House in Cleveland, Ohio. Miss Dickinson, the play and young Haworth were well received by local critics and theatergoers. Miss Dickinson had preceded this engagement with a successful run of the play in Boston the previous May. In March of 1877, Miss Dickinson decided to make her New York debut as actress and playwright with Crown of Thorns. She remembered young Haworth’s work and engaged him to repeat his role. Eagle Theatre manager Josh Hart wanted to shift from music hall to legitimate offerings and booked Miss Dickinson for a six week run. 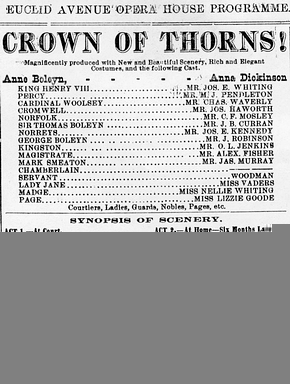 Technical difficulties and cast changes caused a postponement in the play’s opening night, during which the publicity mill ground out ads calling Crown of Thorns an "acknowledged masterpiece of the stage" and "The Greatest Success of the Century." By the time the play opened expectations were high. Crown of Thorns in no way lived up to this hyperbole and the opening night audience was disappointed, and at times laughed ironically and derisively. The March 5, 1877 New York Times, along with every other newspaper, roasted the play and its leading actress. After a lengthy barrage of criticism, the review concluded: "It were a waste of space to go further into the subject, for Miss Dickinson, as an actress and dramatist, has not the slightest claim upon public attention." Joseph Haworth was spared, although the New York Herald said that Cromwell’s costume was ludicrous. Miss Dickinson lashed back and announced that on March 9, 1877, she would answer her critics. On that night, she gave a post-performance speech that lasted over an hour. To an audience that was less than one third filled, she told how triumphantly her performance had been received in Boston. The March 10, 1877 New York Times summarized: "She did not object to being called ugly, old, vile, and atrocious. She did not object to her acting being called bad and her play denounced as wretched, but she did object to such a falsification of facts as the statement that her Boston audience regarded her as a failure." 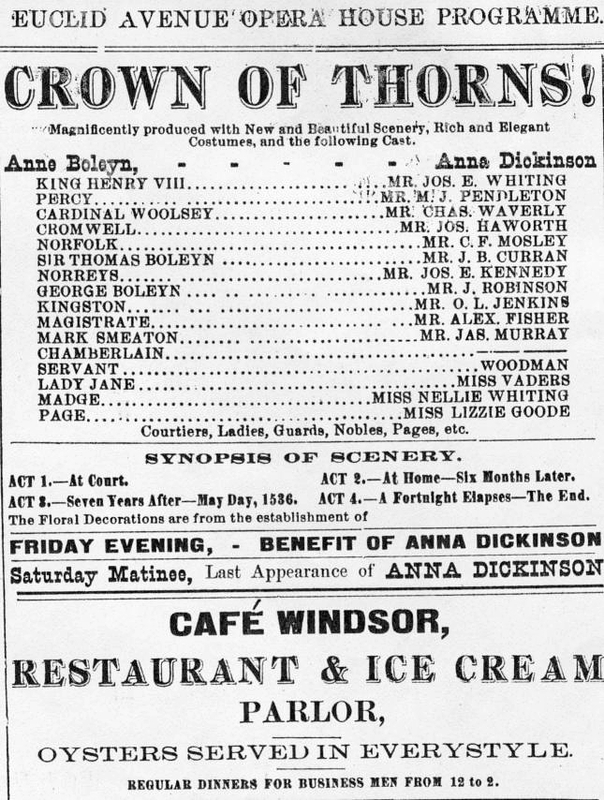 Despite Miss Dickinson’s valiant efforts, Crown of Thorns folded after only a few more performances. The Eagle management hastily substituted The Hunchback and Macbeth to take its place, and Joseph Haworth was retained to play Sir Thomas Clifford and Malcolm respectively. A the end of this engagement, the prestigious Daly’s Theatre hired Joe to play Benvolio in Romeo and Juliet and Guiderius in Cymbeline in support of the great Adelaide Nielson. 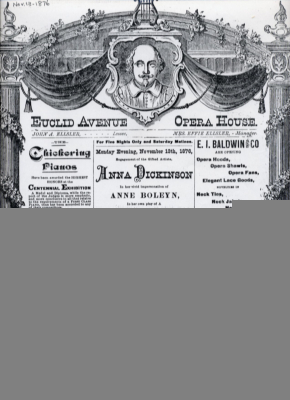 Following this taste of New York, Joe returned to Cleveland for a final season at John Ellsler’s Euclid Avenue Opera House. Joseph Haworth seldom spoke of this early experience in New York theatre. He was in very few failures in his thirty year career. Also, these were the only occasions when New York audiences saw Haworth in anything less than leading roles.